If you are part of your organization's security team, you can use Office 365 Threat Investigation and Response capabilities to protect your users from attacks. 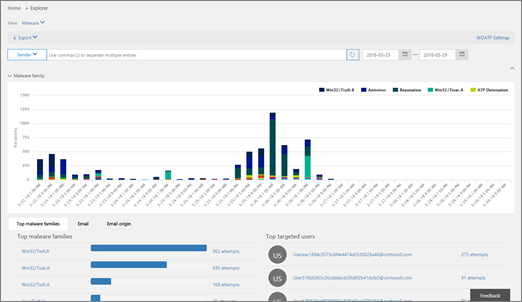 Office 365 Advanced Threat Protection Plan 2 (formerly Office 365 Threat Intelligence) helps security analysts and administrators keep users safe by bubbling up insights and identifying action based on what is happening in their your Office 365 environment. These insights are based on a comprehensive repository of threat intelligence data and systems to spot patterns that correspond to attack behaviors and suspicious activity. Read this article to learn more about threat investigation and response, and how to get started. What are the Threat Investigation and Response capabilities included in Office 365? 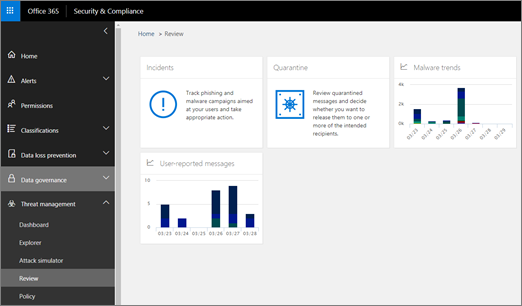 Threat investigation and response capabilities help drive insights into threats and related response actions that are available in the Office 365 Security & Compliance Center. These insights can help your organization's security team protect Office 365 users from email or file based attacks. The capabilities help monitor signals and gathers data from multiple sources, such as user activity, authentication, email, compromised PCs, and security incidents. Business decision makers and Office 365 global administrators, security administrators, and security analysts can all use this information to understand and respond to threats against Office 365 users and protect their intellectual property. Office 365 Threat Intelligence is now Office 365 Advanced Threat Protection Plan 2, along with additional threat protection capabilities. To learn more, see Office 365 Advanced Threat Protection plans and pricing and the Office 365 Advanced Threat Protection Service Description. These threat investigation and response capabilities surface in the Security & Compliance Center, as a set of tools and response workflows, including the threat dashboard, Threat Explorer, Incidents, Attack Simulator, and Automated Investigations & Response. 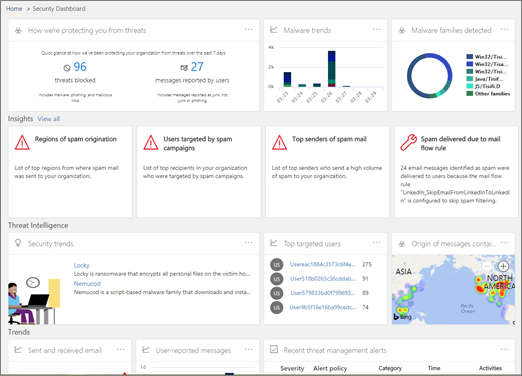 Use the Threat dashboard (this is also referred to as the Security dashboard) to quickly see what threats have been addressed, and as a visual way to report to business decision makers how Office 365 services are securing your business. To view and use this dashboard, in the Security & Compliance Center, go to Threat management > Dashboard. Use the Threat Explorer (this is also called Explorer) to analyze threats, see the volume of attacks over time, and analyze data by threat families, attacker infrastructure, and more. Threat Explorer is the starting place for any security analyst's investigation workflow. To view and use this report, in the Security & Compliance Center, go to Threat management > Explorer. Use the Incidents list (this is also called Investigations) to see a list of in flight security incidents. Incidents are used to track threats such as suspicious email messages, and to conduct further investigation and remediation. To view the list of current incidents for your organization, in the Security & Compliance Center, go to Threat management > Review > Incidents. As part of the Office 365 Advanced Threat Protection Plan 2 offering, security analysts can review details about a known threat. This is useful to determine whether there are additional preventative measures/steps that can be taken to keep users safe. How do we get these Threat investigation and response capabilities? Office 365 Threat Invesigation and Response capabilities are included in Office 365 Advanced Threat Protection Plan 2 and Enterprise E5. If your organization has an Office 365 subscription that does not include these threat investigation and response capabilities, you can purchase these as an add-on along with Office 365 Advanced Threat Protection. For more information about plan options, see Office 365 Platform Service Description: Office 365 Security & Compliance Center and Buy or edit an add-on for Office 365 for business. As an Office 365 global administrator, go to https://admin.microsoft.com and sign in using your work or school account for Office 365. Choose Admin > Billing to see what your current subscription includes. If you see Office 365 Enterprise E5, then your organization has Office 365 Advanced Threat Protection Plan 2 (which includes threat investigation and response capabilities). In the Microsoft 365 admin center, choose Users > Active users. For information about roles, role groups, and permissions, see Permissions in the Office 365 Security & Compliance Center.